As an Apple addict, it is a definitely good way to download your favorite video from YouTube and play it back on your iPhone without restriction of time and place. However, another headache problem is approaching. Ever wondered how could save Youtube video offline to iPhone for Mac? As we know, Apple is restricting Flash, so how to make the FLV video from YouTube playback on iPhone? In addition, YouTube no longer supports 4K video playback in Safari so that you'd better grab 4K video from YouTube for playback on iPhone XS/XS Max/XR, iPhone X, iPhone 8 or iPhone 8 Plus with ease. Luckily, we have a few options to download YouTube videos and save them to iPhone. 1. iOS YouTube download apps. We can still find such apps in the App Store, but it is hit-and-miss. 2. Free online YouTube video downloading services. Web-based services enable you to easily save YouTube clips for iPhone, but most of them don't support 4K UHD, and they are not trustworthy. Ads are everywhere on such sites. 3. YouTube Red. If you are a YouTube Red (YouTube Premium) member, you are allowed to download YouTube videos for offline viewing on iPhone. However, some content may not be available for saving offline due to copyright restrictions. It's not a good choice for users who don't want to pay monthly. 4. Desktop YouTube video downloaders (recommended). This method is reliable and efficient if you use a solid tool. Below we share the quickest and easiest way to download YouTube clips/TV shows/movies and put them to your iPhone (XS/XS/Max/XR/X/8/7, etc.). - Easily download YouTube clips, movies, music, TV shows, and My Playlist in batch. - Support 8K, 4K UHD, 1080p, 720p, 480p, MOV, MP4, any format and resolution. - Convert YouTube videos of FLV, MKV, WMV, etc. to MP4, MOV format for iPhone. - Also save content from Facebook, Instagram, Vimeo, 1000+ sites. Download the iOS YouTube video downloading tool for Windows (Win 10 or below) or for Mac (macOS Mojave also supported). It can help save videos from YouTube for iPhone and iPad running iOS 12 or older iOS version. No jailbreak is required. Launch the software. Click the Downloader icon on the main interface to open the Downloader window. Click the Add Video icon at the top and a Video URL screen pops up. 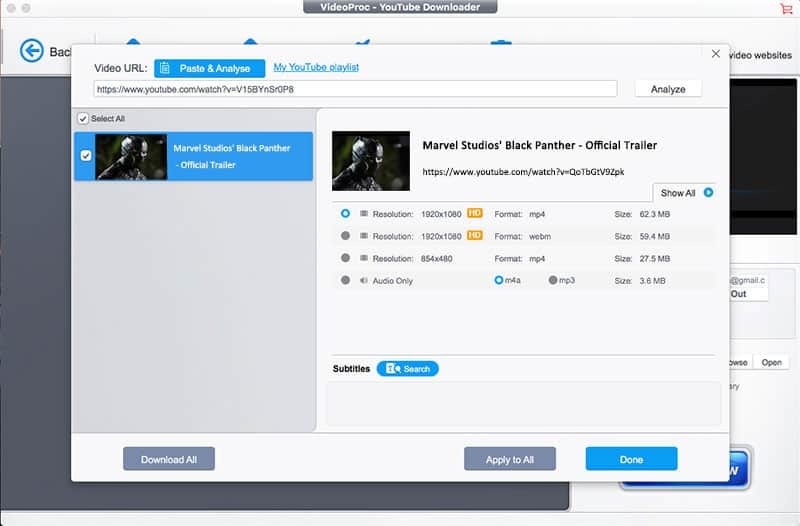 Open YouTube, find the video you want to save for offline viewing on iPhone, copy the URL, go back to the software, click the blue Paste & Analyze button, and the tool starts to analyze the video. Then the video info screen appears. It offers options to select YouTube video resolution, format, and file size. Choose the one you want. You can also save YouTube audio only. On the Subtitles section, click the Search button to search for the subtitle online to save YouTube movies or TV shows with sub. You are also allowed to download your YouTube video playlist to iPhone. Click the Down to save your option and close the window. On the right side, click the Browse button and select a destination folder, then click the Download now button to begin saving YouTube videos for iPhone. It's the same to save videos from Facebook, Vimeo, Dailymotion, or from other video sharing sites for iPhone. After the task finishes, use iTunes or MacX MediaTrans, an easy-to-use iPhone file manager tool, to transfer downloaded YouTube videos to iPhone. Its built-in download engine and advanced algorithm can speed up the process. It is at least 5x faster than free online YouTube downloaders or other apps for iPhone do. The download time for a YouTube video also depends on the output file size and your own internet connection speed. The YouTube video downloading program for iPhone supports saving (live streaming) video with high quality. Learn more about how to capture streaming videos from YouTube, and 1000+ video streaming sites. What If the YouTube Video Is in FLV, MKV, etc. Unaccepted by iPhone? 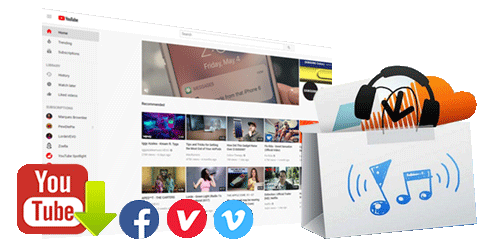 YouTube supports a wide range of video formats, such as MOV, MP4, AVI, WMV, FLV, WebM, ProRes, HEVC (H.265). And some YouTube videos you save may be in a format (FLV, AVI, MKV, WMV, etc.) are not playable on iPhone. In such case, use the iOS YouTube video downloading software to transcode YouTube videos of FLV, MKV, AVI, etc. to MP4 or other iPhone supported video formats. To do so, click Video > + Video, select your YouTube video file to load, choose iPhone (H.264) from the Target Format list. Click the RUN button on the bottom right corner to process downloaded YouTube videos to iPhone video format. It violates YouTube's terms and conditions to download videos from YouTube for iPhone permanently or temporarily. You must save YouTube videos for personal use if you are not the copyright owner. Best YouTube music downloader for macOS (macOS Mojave incl.). How to free download YouTube videos in MP4 format. YouTube offline downloader for viewing YouTube videos offline.